The Tulsa Drillers and the Los Angeles Dodgers announced today that they have extended their Player Development Contract for an additional two years. The new agreement between the two organizations means the Drillers will continue to operate as the Double-A affiliate of the Dodgers through at least the 2020 baseball season. "The Drillers are thrilled to extend our partnership with the Los Angeles Dodgers," said Drillers President Mike Melega. "In the previous four years, Drillers fans have enjoyed many exciting moments from the outstanding young players the Dodgers have brought through our city. It is with great pride that we watch former Drillers make their debuts in Major League Baseball in Dodgers uniforms. We look forward to many more years with the Tulsa Drillers as the Double-A affiliate of the Los Angeles Dodgers." 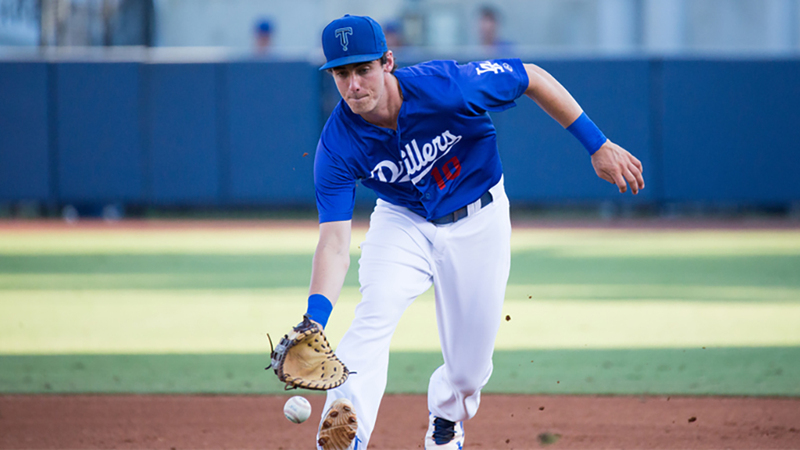 The Drillers have just completed their fourth regular season as a Dodgers minor league affiliate and will be making their second straight appearance in the Texas League playoffs. This season alone, 25 different players appeared in the major leagues who have played with the Drillers during their four years as a Dodgers affiliate. In addition, the last two National League Rookies of the Year, Corey Seager and Cody Bellinger, also played for Tulsa during their minor league careers. The Drillers finished with an overall record of 74-65 this year, including a 40-29 mark in the second half, the best second-half record in the Texas League. They will open play in the Texas League playoffs Wednesday night in North Little Rock with the first game of a best-of-five series with Arkansas. The Dodgers franchise has operated continuously since beginning play in 1890 in Brooklyn, New York. The team moved to Los Angeles, California prior to the 1958 season. In their long history, the Dodgers have appeared in 19 World Series, including last season. There are over 60 players, managers and executives who spent time with the team who are currently in the National Baseball Hall of Fame. All four of the Dodgers full-season, minor league affiliates have qualified for post-season play this year. "We are pleased to announce our continued partnership with our full-season affiliates," said Dodger Director of Player Develpment Brandon Gomes. "We not only value our strong relationships and the first class facilities that are provided, but also the opportunity our men have to develop on the field while positively impacting the community around them."